The decline in the Wisconsin nursing workforce comes at a time when there’s a need for more nurses to tend to an aging population. The 16 million residents, who gained coverage under the Affordable Care Act, coupled with the aging baby boomer population place unprecedented demands on the health care system. Health officials now have to work with educators and other affected parties to attract new nurses to the rapidly growing industry. Nursing education programs ensure students receive the training and preparation needed to work within the changing field of health. Entry into the field requires completion of an associate’s degree or baccalaureate degree in nursing. A 2014 survey of Wisconsin’s registered nurses revealed that 34.86% (25,496) RNs entered the profession with an associate’s degree. The bachelor’s degree remains the primary mode of entry as 41.7% (30,497) respondents of the survey indicated that they completed a BSN program before applying for the licensure exam. It’s worth noting that more than half the nurses who enter the profession with an associate’s degree continue their education to obtain a BSN – in spite of significant barriers to pursuing additional education. However, the state has a long way to go to achieve the IOM’s recommendation that 80% of RNs hold a baccalaureate degree. Hospitals and other medical facilities in Wisconsin, and across the nation, scramble to hire nurses to fill their current shortfalls. The existing shortage is good news for people seeking to start a career in a promising industry. However, anyone desirous of a career as a nurse should have a heartfelt desire to help others. The promise of immediate employment with excellent incentives will attract many, but the stress, fatigue, and complexities of the job will challenge those who do not have a real desire for patient care. The associate’s degree in nursing program equips students with the knowledge and skills to provide safe and effective nursing. The program’s curriculum will emphasize the core values of nursing and promote lifelong learning. It will include didactic and practical nursing experiences to prepare graduates for an entry-level position in a variety of settings, including long-term and transitional facilities. Upon completion of the program, graduates will be eligible to apply to the Wisconsin Board of Nursing for authorization to take the NCLEX-RN. In the classroom, instructors will begin with the preparatory courses, such as medical terminology, growth and development, health assessment, and introduction to nursing. The core nursing cores will follow in a sequence and will include topics, such as mental health nursing, maternal newborn nursing, medical surgical nursing, geriatric nursing, nursing leadership, transition to professional practice, and contemporary issues in practice. The didactic instruction will take the form of lectures, demonstrations, presentations, and hands-on practice in a simulated lab and will set the stage for the clinical experience, which will take place in one or several medical facilities. The clinical experience is an integral part of the course that will require full attendance. A registered nurse instructor will direct students’ activities as they work alongside health care professionals to care for patients in a medical setting. As a prerequisite to this component of the program, students will need to complete a criminal background check and obtain CPR certification, pass a TB test, and provide documentation of up-to-date immunizations or a waiver. State and federal laws permit persons with specific convictions from obtaining a license to practice as a registered nurse. Licensed practical nurses may qualify for advanced placement in a registered nursing program. A high school student who has an interest in nursing should complete chemistry, biology, and anatomy in preparation for the college courses. Select a program that the WI Board of Nursing recognizes to avoid problems during the licensure process. Completing a program that is not approved by the Board could affect your ability to take the NNCLEX-RN and obtain licensure as a registered nurse. It could also affect your ability to further your education, especially if the program is not accredited by a nationally recognized agency. Enrolling in a nursing education program typically requires the student to attend a nursing information session where all the requirements and expectations for the program will be mapped out. Common requirements include a completed application and fee, a caregiver background check, an admissions interview, and an entrance assessment to determine placement in the exam. Students must have a high school diploma or equivalent and be computer literate. The estimated total program cost for a two-year associate degree nursing program in Wisconsin is approximately $11,000. The cost does not include expenses for books, uniforms, supplies, equipment, and fees. Administrative costs for immunization, physical exam, CPR, nursing assistant training and certification, liability insurance, TB test, and entrance testing are the student’s responsibility. The Wisconsin Board of Nursing regulates the profession of nursing to protect public health, safety, and welfare by developing and implementing standards for practice. It also maintains a database of registered nurses and keeps track of active nurses through the renewal process. 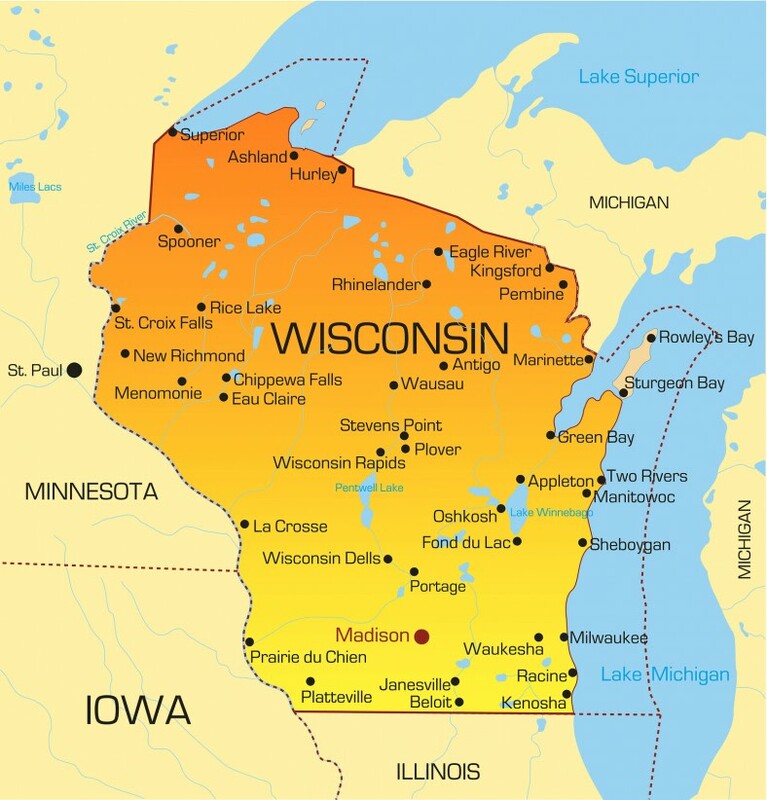 As a compact state, Wisconsin permits nurses licensed in other compact states to practice without registration in accordance with the compact agreement. Applicants for registration must declare Wisconsin as their primary state of registration and submit supporting documentation to validate their claim. To apply for licensure as a registered nurse with the Wisconsin Board of Nursing, you must have completed high school or its equivalent and a Board-approved nursing program. If you apply for registration based on your completion of the Pre-MSN basic nursing requirements, there’s no guarantee that you’ll qualify for an RN license in other states. Attach the application processing fee of $90. The fee is non-refundable. Make check payable to DSPS and attach to the application. Enclose verification of any nursing license held outside the US or any LPN licenses held in any state outside of Wisconsin. Use the NURSYS website to submit your verification to the WI Board of Nursing if verifying from another state. If the state does not participate with the NURSYS, contact the state board directly and request that they send verification of your license to the WI Board of Nursing at the address provided below or emailed to [email protected]. Complete and Statement of Graduation or Completion (DSPS Form #259) and forward to the Board-approved nursing school for completion. The school should complete the form only after you’ve graduated from the program and return it directly to the WI DSPS. Submissions from the applicant will be rejected. If you completed the nursing education program from a non-WI state board-approved program, you must request an official transcript to be sent directly to the Board. Complete and submit the Temporary Permit for Exam Applicants (Form #2434) if you need a temporary permit. The temporary permit fee is $10. Register for the NCLEX. Go online to vue.com and follow the instructions to complete your registration. The Board recommends that you register for the exam before the school submits your statement of graduation/transcript. A temporary permit is valid for three months or until you receive notification of failing the NCLEX exam. You must complete the application for licensure form before you qualify for a temporary permit. While practicing under a temporary permit, you must use the title Graduate Nurse and practice under the direct supervision of a registered nurse. The overall timeframe for processing your license is approximately 8 to 12 weeks. When you meet all the requirements for licensure, the Board will send email notification indicating that they’ve granted the license and provide instructions for printing a copy of the permit online. The DSPS will not mail a hard copy of the license. If your file remains inactive for more than one year, the Board will remove it from the system without notification. The following instructions apply to applicants who completed their nursing education outside the United States, including those who graduated from a program in the US territory or Canada. Contact the Commission on Graduates of Foreign Nursing Schools (CGFNS) to request a certificate to be sent directly to the Board of Nursing. Apply for licensure by endorsement if you’re currently licensed to practice as a registered nurse in another state. Attach the application processing fee of $82. The fee is non-refundable. Make check payable to DSPS and attach to the application. Enclose verification of licensure of your initial exam state and current state. If you’re currently licensed in the state where you initially took the exam, then only a license from that state will be required. Use the NURSYS website to submit your verification to the WI Board of Nursing. If the state does not participate with the NURSYS, contact the state board directly and request that they send verification of your license to the WI Board of Nursing at the address provided below or email to [email protected]. An application for a temporary permit to practice will only become necessary if your initial state of licensure or your current state of licensure does not participate in the NURSYS license verification. If your application needs to be reviewed, due to convictions or malpractice, you will not qualify for a temporary permit. If you need a temporary permit, check the temporary permit box on the application and enclose the $10 processing fee. Your registered nurse license will expire on 02/28 on 02/29 on even-numbered years. The renewal fee is $86 or $111 with late fee. The DSPS will mail a green renewal postcard in January if your license is active. The postcard will include instructions for completing the renewal process and a link to an online survey and guidelines for receiving forms to renew by mail. You must complete the 10 to 20-minute survey as part of the renewal process. You’ll need your nursing credential number and pin, the year you received your first RN license, the year you received your diploma(s), and the county and zip of your workplace to complete the survey. Since Wisconsin is a compact state, you must complete RES (Report State of Primary Residency) as part of the application process. There are no continuing education requirements for renewing a Wisconsin RN license. A registered nurse who has not been employed in a position that requires a registered nurse license within the last five years must apply to the Board for a limited license to complete a nursing refresher course that is approved by the Board. Wisconsin’s nursing workforce may not be in a crisis state as the rest of the country, but the expected retirement of 20,000 nurses by 2035 could have a serious impact on healthcare. The projected shortage of nurses has been held in check, in part, by the sagging economy that has many nurses delaying retirement to boost their financial security. In order to prepare for a mass exodus of nurses, the Board of Nursing and educational institutions have taken steps to boost the workforce through the addition of new graduates, especially in the West and Northeast regions. Although the retirement of current nurses will contribute to a shortage in the workforce, new models of health care delivery that emphasize prevention, and the aging population will also contribute significantly to rising health care needs. Currently, Wisconsin produces approximately 3,100 graduates annually, but efforts are underway to double the number through the addition of more nursing faculty, classroom space, and clinical spots. For new graduates, employment opportunities abound in rural areas and for specific services – such as geriatric and long-term care. More than 80% of graduates obtain employment with 12 months of graduation. A large number of the workforce is employed in hospitals (52.8%). The results of a State Board Survey reveal that 75.7% of RNs work in direct care utilizing their medical-surgical skills in various healthcare setting. Other in-demand clinical specialties include intensive care (25%) and geriatrics (20.6%). The annual mean wage for registered nurses in Wisconsin is $66,440. Copyright Nursing Degree Programs. All rights reserved.